3/5/14 Unit 3. THE HUMAN BODY.  3 A- HUMAN NUTRITION. 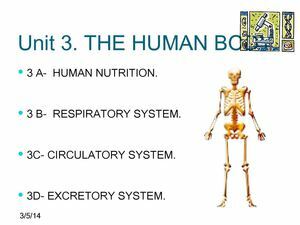  3 B- RESPIRATORY SYSTEM.  3C- CIRCULATORY SYSTEM.  3D- EXCRETORY SYSTEM.